Scotch-Irish (or Scots-Irish) Americans are American descendants of Ulster Protestants, who migrated during the 18th and 19th centuries. In the 2017 American Community Survey, 5.39 million (1.7% of the population) reported Scottish ancestry, an additional 3 million (0.9% of the population) identified more specifically with Scotch-Irish ancestry, and many people who claim "American ancestry" may actually be of Scotch-Irish ancestry. The term Scotch-Irish is used primarily in the United States, with people in Great Britain or Ireland who are of a similar ancestry identifying as Ulster Scots people. Most of these emigres from Ireland had been recent settlers, or the descendants of settlers, from the Kingdom of England or the Kingdom of Scotland who had gone to the Kingdom of Ireland to seek economic opportunities and freedom from the control of the episcopal Church of England and the Scottish Episcopal Church. These included 200,000 Scottish Presbyterians who settled in Ireland between 1608 and 1697. Many English-born settlers of this period were also Presbyterians, although the denomination is today most strongly identified with Scotland. When King Charles I attempted to force these Presbyterians into the Church of England in the 1630s, many chose to re-emigrate to North America where religious liberty was greater. Later attempts to force the Church of England's control over dissident Protestants in Ireland were to lead to further waves of emigration to the trans-Atlantic colonies. "We are given to understand that a nobleman named 'Sorley Boy' [MacDonnel] and others, who be of the Scotch-Irish race..."
This term continued in usage for over a century before the earliest known American reference appeared in a Maryland affidavit in 1689/90. Scotch-Irish says Leyburn, "is an Americanism, generally unknown in Scotland and Ireland, and rarely used by British historians." It is "The more usual term in North America" says the Oxford English Dictionary, which gives it a score of 3/8 in terms of current usage. It became common in the United States after 1850. The term is somewhat ambiguous because some of the Scotch-Irish have little or no Scottish ancestry at all: numerous dissenter families had also been transplanted to Ulster from northern England, in particular the border counties of Northumberland and Cumberland. Smaller numbers of migrants also came from Wales and the southeast of England, and others were Protestant religious refugees from Flanders, the German Palatinate, and France (such as the French Huguenot ancestors of Davy Crockett). What united these different national groups was a base of Calvinist religious beliefs, and their separation from the established church (the Church of England and Church of Ireland in this case). That said, the large ethnic Scottish element in the Plantation of Ulster gave the settlements a Scottish character. Upon arrival in North America, these migrants at first usually identified simply as Irish, without the qualifier Scotch. It was not until a century later, following the surge in Irish immigration after the Great Irish Famine of the 1840s, that the descendants of the earlier arrivals began to commonly call themselves Scotch-Irish to distinguish themselves from the newer, predominantly Catholic and poor immigrants; these largely had no Scottish ancestry. At first, the two groups had little interaction in America, as the Scots-Irish had become settled decades earlier, primarily in the backcountry of the Appalachian region. The new wave of Catholic Irish settled primarily in port cities such as Boston, New York, Charleston, Chicago, Memphis and New Orleans, where large immigrant communities formed and there were an increasing number of jobs. Many of the new Irish migrants also went to the interior in the 19th century, attracted to jobs on large-scale infrastructure projects such as canals and railroads. The usage Scots-Irish developed in the late 19th century as a relatively recent version of the term. Two early citations include: 1) "a grave, elderly man of the race known in America as "Scots-Irish" (1870); and 2) "Dr. Cochran was of stately presence, of fair and florid complexion, features which testified his Scots-Irish descent" (1884) In Ulster-Scots (or "Ullans"), Scotch-Irish Americans are referred to as the Scotch Airish o' Amerikey. Twentieth-century English author Kingsley Amis endorsed the traditional Scotch-Irish usage implicitly in noting that "nobody talks about butterscottish or hopscots,...or Scottish pine", and that while Scots or Scottish is how people of Scots origin refer to themselves in Scotland, the traditional English usage Scotch continues to be appropriate in "compounds and set phrases". An example, showing the usage of Scotch as an adjective, in the 4th edition of Encyclopædia Britannica, Edinburgh, Scotland (1800), and modernized in the 7th edition (1829). This usage appears hundreds of times throughout the work. The word "Scotch" was the favored adjective for things "of Scotland", including people, until the early 19th century, when it was replaced by the word "Scottish". People in Scotland refer to themselves as Scots, as a noun, or adjectivally/collectively as Scots or Scottish. The use of "Scotch" as an adjective for anything but whiskey has been out of favor in the U.K. for 200 years, but remains in use in the U.S. in place names, names of plants, breeds of dog, a type of tape, etc., and in the term Scotch-Irish. Although referenced by Merriam-Webster dictionaries as having first appeared in 1744, the American term Scotch-Irish is undoubtedly older. An affidavit of William Patent, dated March 15, 1689, in a case against a Mr. Matthew Scarbrough in Somerset County, Maryland, quotes Mr. Patent as saying he was told by Scarbrough that "... it was no more sin to kill me then to kill a dogg, or any Scotch Irish dogg ..."
Leyburn cites the following as early American uses of the term before 1744. The earliest is a report in June 1695, by Sir Thomas Laurence, Secretary of Maryland, that "In the two counties of Dorchester and Somerset, where the Scotch-Irish are numerous, they clothe themselves by their linen and woolen manufactures." In September 1723, Rev. George Ross, Rector of Immanuel Church in New Castle, Delaware, wrote in reference to their anti-Church of England stance that, "They call themselves Scotch-Irish... and the bitterest railers against the church that ever trod upon American ground." Another Church of England clergyman from Lewes, Delaware, commented in 1723 that "great numbers of Irish (who usually call themselves Scotch-Irish) have transplanted themselves and their families from the north of Ireland." 1744 W. MARSHE Jrnl. 21 June in Collections of the Massachusetts Historical Society. (1801) 1st Ser. VII. 177: 'The inhabitants [of Lancaster, Pa.] are chiefly High-Dutch, Scotch-Irish, some few English families, and unbelieving Israelites." Its citations include examples after that into the late 19th century. Some historians describe these immigrants as "Ulster Irish" or "Northern Irish". It is true that many sailed from the province of Ulster ... part of much larger flow which drew from the lowlands of Scotland, the north of England, and every side of the Irish Sea. Many scholars call these people Scotch-Irish. That expression is an Americanism, rarely used in Britain and much resented by the people to whom it was attached. "We're no Eerish bot Scoatch," one of them was heard to say in Pennsylvania. Fischer prefers to speak of "borderers" (referring to the historically war-torn England-Scotland border) as the population ancestral to the "backcountry" "cultural stream" (one of the four major and persistent cultural streams from the British Isles which he identifies in American history). He notes the borderers were not purely Celtic but also had substantial Anglo-Saxon and Viking or Scandinavian roots. He described them as quite different from Celtic-speaking groups such as the Scottish Highlanders or Irish (that is, Gaelic-speaking and Roman Catholic). An example of the use of the term is found in A History of Ulster: "Ulster Presbyterians – known as the 'Scotch Irish' – were already accustomed to being on the move, and clearing and defending their land." Many Irish have claimed that such a distinction should not be used, and that those called Scotch-Irish are simply Irish. Other Irish limit the term Irish to those of native Gaelic stock, and prefer to describe the Ulster Protestants as British (a description many Ulster Protestants have preferred themselves to Irish, at least since the Irish Free State broke free from the United Kingdom, although Ulstermen has been adopted in order to maintain a distinction from the native Irish Gaels while retaining a claim to the North of Ireland). However, as one scholar observed in 1944, "... in this country [USA], where they have been called Scotch-Irish for over two hundred years, it would be absurd to give them a name by which they are not known here. ... Here their name is Scotch-Irish; let us call them by it." From 1710 to 1775, over 200,000 people emigrated from Ulster to the original thirteen American colonies. The largest numbers went to Pennsylvania. From that base some went south into Virginia, the Carolinas and across the South, with a large concentration in the Appalachian region. Others headed west to western Pennsylvania, Ohio, Indiana, and the Midwest. Transatlantic flows were halted by the American Revolution, but resumed after 1783, with total of 100,000 arriving in America between 1783 and 1812. By that point few were young servants and more were mature craftsmen, and they settled in industrial centers, including Pittsburgh, Philadelphia and New York, where many became skilled workers, foremen and entrepreneurs as the Industrial Revolution took off in the U.S. Another half million came to America 1815 to 1845; another 900,000 came in 1851-99. That religion decisively shaped Scotch-Irish culture. According to the Harvard Encyclopedia of American Ethnic Groups, there were 400,000 U.S. residents of Irish birth or ancestry in 1790 and half of this group was descended from Ulster, and half from the other three provinces of Ireland. A separate migration brought many to Canada, where they are most numerous in rural Ontario and Nova Scotia. Because of the proximity of the islands of Britain and Ireland, migrations in both directions had been occurring since Ireland was first settled after the retreat of the ice sheets. Gaels from Ireland colonized current southwestern Scotland as part of the Kingdom of Dál Riata, eventually replacing the native Pictish culture throughout Scotland. The Irish Gaels had previously been named Scoti by the Romans, and eventually their name was applied to the entire Kingdom of Scotland. The origins of the Scotch-Irish lie primarily in the Lowlands of Scotland and in northern England, particularly in the Border Country on either side of the Anglo-Scottish border, a region that had seen centuries of conflict. In the near constant state of war between England and Scotland during the Middle Ages, the livelihood of the people on the borders was devastated by the contending armies. Even when the countries were not at war, tension remained high, and royal authority in one or the other kingdom was often weak. The uncertainty of existence led the people of the borders to seek security through a system of family ties, similar to the clan system in the Scottish Highlands. Known as the Border Reivers, these families relied on their own strength and cunning to survive, and a culture of cattle raiding and thievery developed. Map of Ireland. 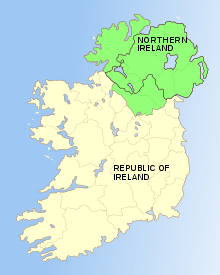 The counties are indicated by thin black lines, including those in Ulster in green, and the modern territory of Northern Ireland indicated by a heavy black border across the island that separates six of the Ulster counties from the other three. Scotland and England became unified under a single monarch with the Union of the Crowns in 1603, when James VI, King of Scots, succeeded Elizabeth I as ruler of England. In addition to the unstable border region, James also inherited Elizabeth's conflicts in Ireland. Following the end of the Irish Nine Years' War in 1603, and the Flight of the Earls in 1607, James embarked in 1609 on a systematic plantation of English and Scottish Protestant settlers to Ireland's northern province of Ulster. The Plantation of Ulster was seen as a way to relocate the Border Reiver families to Ireland to bring peace to the Anglo-Scottish border country, and also to provide fighting men who could suppress the native Irish in Ireland. The first major influx of Scots and English into Ulster had come in 1606 during the settlement of east Down onto land cleared of native Irish by private landlords chartered by James. This process was accelerated with James's official plantation in 1609, and further augmented during the subsequent Irish Confederate Wars. The first of the Stuart Kingdoms to collapse into civil war was Ireland where, prompted in part by the anti-Catholic rhetoric of the Covenanters, Irish Catholics launched a rebellion in October. In reaction to the proposal by Charles I and Thomas Wentworth to raise an army manned by Irish Catholics to put down the Covenanter movement in Scotland, the Parliament of Scotland had threatened to invade Ireland in order to achieve "the extirpation of Popery out of Ireland" (according to the interpretation of Richard Bellings, a leading Irish politician of the time). The fear this caused in Ireland unleashed a wave of massacres against Protestant English and Scottish settlers, mostly in Ulster, once the rebellion had broken out. All sides displayed extreme cruelty in this phase of the war. Around 4000 settlers were massacred and a further 12,000 may have died of privation after being driven from their homes. The number of native Irish that died as a result of the Scottish colonisation is over 1,000,000, other estimations are higher. This caused Ireland's population, combined with the Irish catholic refugees fleeing to drop by 25%. William Petty's figure of 37,000 Protestants massacred... is far too high, perhaps by a factor of ten, certainly more recent research suggests that a much more realistic figure is roughly 4,000 deaths. In one notorious incident, the Protestant inhabitants of Portadown were taken captive and then massacred on the bridge in the town. The settlers responded in kind, as did the British-controlled government in Dublin, with attacks on the Irish civilian population. Massacres of native civilians occurred at Rathlin Island and elsewhere. In early 1642, the Covenanters sent an army to Ulster to defend the Scottish settlers there from the Irish rebels who had attacked them after the outbreak of the rebellion. The original intention of the Scottish army was to re-conquer Ireland, but due to logistical and supply problems, it was never in a position to advance far beyond its base in eastern Ulster. The Covenanter force remained in Ireland until the end of the civil wars but was confined to its garrison around Carrickfergus after its defeat by the native Ulster Army at the Battle of Benburb in 1646. After the war was over, many of the soldiers settled permanently in Ulster. Another major influx of Scots into Ulster occurred in the 1690s, when tens of thousands of people fled a famine in Scotland to come to Ireland. A few generations after arriving in Ireland, considerable numbers of Ulster-Scots emigrated to the North American colonies of Great Britain throughout the 18th century (between 1717 and 1770 alone, about 250,000 settled in what would become the United States). According to Kerby Miller, Emigrants and Exiles: Ireland and the Irish Exodus to North America (1988), Protestants were one-third the population of Ireland, but three-quarters of all emigrants leaving from 1700 to 1776; 70% of these Protestants were Presbyterians. Other factors contributing to the mass exodus of Ulster Scots to America during the 18th century were a series of droughts and rising rents imposed by often absentee English and/or Anglo-Irish landlords. During the course of the 17th century, the number of settlers belonging to Calvinist dissenting sects, including Scottish and Northumbrian Presbyterians, English Baptists, French and Flemish Huguenots, and German Palatines, became the majority among the Protestant settlers in the province of Ulster. However, the Presbyterians and other dissenters, along with Catholics, were not members of the established church and were consequently legally disadvantaged by the Penal Laws, which gave full rights only to members of the Church of England/Church of Ireland. Those members of the state church were often absentee landlords and the descendants of the British aristocracy who had been given land by the monarchy. For this reason, up until the 19th century, and despite their common fear of the dispossessed Catholic native Irish, there was considerable disharmony between the Presbyterians and the Protestant Ascendancy in Ulster. As a result of this many Ulster-Scots, along with Catholic native Irish, ignored religious differences to join the United Irishmen and participate in the Irish Rebellion of 1798, in support of Age of Enlightenment-inspired egalitarian and republican goals. Scholarly estimate is that over 200,000 Scotch-Irish migrated to the Americas between 1717 and 1775. As a late arriving group, they found that land in the coastal areas of the British colonies was either already owned or too expensive, so they quickly left for the more mountainous interior where land could be obtained cheaply. Here they lived on the first frontier of America. Early frontier life was extremely challenging, but poverty and hardship were familiar to them. The term hillbilly has often been applied to their descendants in the mountains, carrying connotations of poverty, backwardness and violence; this word has its origins in Scotland and Ireland. The first trickle of Scotch-Irish settlers arrived in New England. Valued for their fighting prowess as well as for their Protestant dogma, they were invited by Cotton Mather and other leaders to come over to help settle and secure the frontier. In this capacity, many of the first permanent settlements in Maine and New Hampshire, especially after 1718, were Scotch-Irish and many place names as well as the character of Northern New Englanders reflect this fact. The Scotch-Irish brought the potato with them from Ireland (although the potato originated in South America, it was not known in North America until brought over from Europe). In Maine it became a staple crop as well as an economic base. From 1717 to the next thirty or so years, the primary points of entry for the Ulster immigrants were Philadelphia, Pennsylvania, and New Castle, Delaware. The Scotch-Irish radiated westward across the Alleghenies, as well as into Virginia, North Carolina, South Carolina, Georgia, Kentucky, and Tennessee. The typical migration involved small networks of related families who settled together, worshipped together, and intermarried, avoiding outsiders. Most Scotch-Irish headed for Pennsylvania, with its good lands, moderate climate, and liberal laws. By 1750, the Scotch-Irish were about a fourth of the population, rising to about a third by the 1770s. Without much cash, they moved to free lands on the frontier, becoming the typical western "squatters", the frontier guard of the colony, and what the historian Frederick Jackson Turner described as "the cutting-edge of the frontier". The Scotch-Irish moved up the Delaware River to Bucks County, and then up the Susquehanna and Cumberland valleys, finding flat lands along the rivers and creeks to set up their log cabins, their grist mills, and their Presbyterian churches. Chester, Lancaster, and Dauphin counties became their strongholds, and they built towns such as Chambersburg, Gettysburg, Carlisle, and York; the next generation moved into western Pennsylvania. With large numbers of children who needed their own inexpensive farms, the Scotch-Irish avoided areas already settled by Germans and Quakers and moved south, through the Shenandoah Valley, and through the Blue Ridge Mountains into Virginia. These migrants followed the Great Wagon Road from Lancaster, through Gettysburg, and down through Staunton, Virginia, to Big Lick (now Roanoke), Virginia. Here the pathway split, with the Wilderness Road taking settlers west into Tennessee and Kentucky, while the main road continued south into the Carolinas. Because the Scotch-Irish settled the frontier of Pennsylvania and western Virginia, they were in the midst of the French and Indian War and Pontiac's Rebellion that followed. The Scotch-Irish were frequently in conflict with the Indian tribes who lived on the other side of the frontier; indeed, they did most of the Indian fighting on the American frontier from New Hampshire to the Carolinas. The Irish and Scots also became the middlemen who handled trade and negotiations between the Indian tribes and the colonial governments. Especially in Pennsylvania, whose pacifist Quaker leaders had made no provision for a militia, Scotch-Irish settlements were frequently destroyed and the settlers killed, captured or forced to flee after attacks by Native Americans from tribes of the Delaware (Lenape), Shawnee, Seneca, and others of western Pennsylvania and the Ohio country. Indian attacks were taking place within 60 miles of Philadelphia, and in July 1763, the Pennsylvania Assembly authorized a 700-strong militia to be raised, to be used only for defensive actions. Formed into two units of rangers, the Cumberland Boys and the Paxton Boys, the militia soon exceeded their defensive mandate and began offensive forays against Lenape villages in western Pennsylvania. After attacking Delaware villages in the upper Susquehanna valley, the militia leaders received information, which they believed credible, that "hostile" tribes were receiving weapons and ammunition from the "friendly" tribe of Conestogas settled in Lancaster County, who were under the protection of the Pennsylvania Assembly. On 14 December 1763, about fifty Paxton Boys rode to Conestogatown, near Millersville, PA, and murdered six Conestogas. Governor John Penn placed the remaining fourteen Conestogas in protective custody in the Lancaster workhouse, but the Paxton Boys broke in, killing and mutilating all fourteen on 27 December 1763. Following this, about 400 backcountry settlers, primarily Scotch-Irish, marched on Philadelphia demanding better military protection for their settlements, and pardons for the Paxton Boys. Benjamin Franklin led the politicians who negotiated a settlement with the Paxton leaders, after which they returned home. The United States Declaration of Independence contained 56 delegate signatures. Of the signers, eight were of Irish descent. Two signers, George Taylor and James Smith, were born in Ulster. The remaining five Irish-Americans, George Read, Thomas McKean, Thomas Lynch, Jr., Edward Rutledge and Charles Carroll, were the sons or grandsons of Irish immigrants, and at least McKean had Ulster heritage. The Scotch-Irish "Overmountain Men" of Virginia and North Carolina formed a militia which won the Battle of Kings Mountain in 1780, resulting in the British abandonment of a southern campaign, and for some historians "marked the turning point of the American Revolution". One exception to the high level of patriotism was the Waxhaw settlement on the lower Catawba River along the North Carolina-South Carolina boundary, where Loyalism was strong. The area experienced two main settlement periods of Scotch-Irish. During the 1750s–1760s, second- and third-generation Scotch-Irish Americans moved from Pennsylvania, Virginia, and North Carolina. This particular group had large families, and as a group they produced goods for themselves and for others. They generally were Patriots. Just prior to the Revolution, a second stream of immigrants came directly from Ireland via Charleston. This group was forced to move into an underdeveloped area because they could not afford expensive land. Most of this group remained loyal to the Crown or neutral when the war began. Prior to Charles Cornwallis's march into the backcountry in 1780, two-thirds of the men among the Waxhaw settlement had declined to serve in the army. The British massacre of American prisoners at the Battle of Waxhaws resulted in anti-British sentiment in a bitterly divided region. While many individuals chose to take up arms against the British, the British themselves forced the people to choose sides. In the 1790s, the new American government assumed the debts the individual states had amassed during the American Revolutionary War, and the Congress placed a tax on whiskey (among other things) to help repay those debts. Large producers were assessed a tax of six cents a gallon. Smaller producers, many of whom were Scottish (often Scotch-Irish) descent and located in the more remote areas, were taxed at a higher rate of nine cents a gallon. These rural settlers were short of cash to begin with, and lacked any practical means to get their grain to market, other than fermenting and distilling it into relatively portable spirits. From Pennsylvania to Georgia, the western counties engaged in a campaign of harassment of the federal tax collectors. "Whiskey Boys" also conducted violent protests in Maryland, Virginia, North Carolina and South Carolina, and Georgia. This civil disobedience eventually culminated in armed conflict in the Whiskey Rebellion. President George Washington marched at the head of 13,000 soldiers to suppress the insurrection. Author and U.S. Senator Jim Webb puts forth a thesis in his book Born Fighting (2004) to suggest that the character traits he ascribes to the Scotch-Irish such as loyalty to kin, extreme mistrust of governmental authority and legal strictures, and a propensity to bear arms and to use them, helped shape the American identity. In the same year that Webb's book was released, Barry A. Vann published his second book, entitled Rediscovering the South's Celtic Heritage. Like his earlier book, From Whence They Came (1998), Vann argues that these traits have left their imprint on the Upland South. In 2008, Vann followed up his earlier work with a book entitled In Search of Ulster Scots Land: The Birth and Geotheological Imagings of a Transatlantic People, which professes how these traits may manifest themselves in conservative voting patterns and religious affiliation that characterizes the Bible Belt. The iron and steel industry developed rapidly after 1830 and became one of the dominant factors in industrial America by the 1860s. Ingham (1978) examined the leadership of the industry in its most important center, Pittsburgh, as well as smaller cities. He concludes that the leadership of the iron and steel industry nationwide was "largely Scotch-Irish". Ingham finds that the Scotch-Irish held together cohesively throughout the 19th century and "developed their own sense of uniqueness". New immigrants after 1800 made Pittsburgh a major Scotch-Irish stronghold. For example, Thomas Mellon (b. Ulster; 1813–1908) left Ireland in 1823 and became the founder of the famous Mellon clan, which played a central role in banking and industries such as aluminum and oil. As Barnhisel (2005) finds, industrialists such as James H. Laughlin (b. Ulster; 1806–1882) of Jones and Laughlin Steel Company constituted the "Scots-Irish Presbyterian ruling stratum of Pittsburgh society". Archeologists and folklorists have examined the folk culture of the Scotch-Irish in terms of material goods—such as housing—as well as speech patterns and folk songs. Much of the research has been done in Appalachia. The border origin of the Scotch-Irish is supported by study of the traditional music and folklore of the Appalachian Mountains, settled primarily by the Scotch-Irish in the 18th century. Musicologist Cecil Sharp collected hundreds of folk songs in the region, and observed that the musical tradition of the people "seems to point to the North of England, or to the Lowlands, rather than the Highlands, of Scotland, as the country from which they originally migrated. For the Appalachian tunes...have far more affinity with the normal English folk-tune than with that of the Gaelic-speaking Highlander." Similarly, elements of mountain folklore trace back to events in the Lowlands of Scotland. As an example, it was recorded in the early 20th century that Appalachian children were frequently warned, "You must be good or Clavers will get you." To the mountain residents, "Clavers" was simply a bogeyman used to keep children in line, yet unknown to them the phrase derives from the 17th century Scotsman John Graham of Claverhouse, called "Bloody Clavers" by the Presbyterian Scottish Lowlanders whose religion he tried to suppress. In terms of the stone houses they built, the "hall-parlor" floor plan (two rooms per floor with chimneys on both ends) was common among the gentry in Ulster. Scotch-Irish immigrants brought it over in the 18th century and it became a common floor plan in Tennessee, Kentucky, and elsewhere. Stone houses were difficult to build, and most pioneers relied on simpler log cabins. Scotch-Irish quilters in West Virginia developed a unique interpretation of pieced-block quilt construction. Their quilts embody an aesthetic reflecting Scotch-Irish social history—the perennial condition of living on the periphery of mainstream society both geographically and philosophically. Cultural values espousing individual autonomy and self-reliance within a strong kinship structure are related to Scotch-Irish quilting techniques. Prominent features of these quilts include: 1) blocks pieced in a repeating pattern but varied by changing figure-ground relationships and, at times, obscured by the use of same-value colors and adjacent print fabrics, 2) lack of contrasting borders, and 3) a unified all-over quilting pattern, typically the "fans" design or rows of concentric arcs. Montgomery (2006) analyzes the pronunciation, vocabulary, and grammatical distinctions of today's residents of the mountain South and traces patterns back to their Scotch-Irish ancestors. However, Crozier (1984) suggests that only a few lexical characteristics survived Scotch-Irish assimilation into American culture. According to The Source: A Guidebook of American Genealogy, by Kory L. Meyerink and Loretto Dennis Szucs, the following were the countries of origin for new arrivals coming to the United States before 1790. The regions marked * were part of, or ruled by, the Kingdom of Great Britain. (The United Kingdom of Great Britain and Ireland after 1801) The ancestry of the 3,929,326 million population in 1790 has been estimated by various sources by sampling last names in the 1790 census and assigning them a country of origin. According to the Harvard Encyclopedia of American Ethnic Groups (Thernstrom, S 1980, 'Irish,' p. 528), there were 400,000 Americans of Irish birth or ancestry in 1790; half of these were descended from Ulster, and half were descended from other provinces in Ireland. The French were mostly Huguenots and French Canadians. although only 17% of all Americans had any religious affiliation.The Indian population inside territorial U.S. 1790 boundaries was less than 100,000. Finding the coast already heavily settled, most groups of settlers from the north of Ireland moved into the "western mountains", where they populated the Appalachian regions and the Ohio Valley. Others settled in northern New England, The Carolinas, Georgia and north-central Nova Scotia. In the United States Census, 2000, 4.3 million Americans (1.5% of the U.S. population) claimed Scotch-Irish ancestry. The author Jim Webb suggests that the true number of people with some Scotch-Irish heritage in the United States is in the region of 27 million. The Scotch-Irish immigrants to North America in the 18th century were initially defined in part by their Presbyterianism. Many of the settlers in the Plantation of Ulster had been from dissenting/non-conformist religious groups which professed a strident Calvinism. These included mainly Lowland Scot Presbyterians, but also English Puritans and Quakers, French Huguenots and German Palatines. These Calvinist groups mingled freely in church matters, and religious belief was more important than nationality, as these groups aligned themselves against both their Catholic Irish and Anglican English neighbors. After their arrival in the New World, the predominantly Presbyterian Scotch-Irish began to move further into the mountainous back-country of Virginia and the Carolinas. The establishment of many settlements in the remote back-country put a strain on the ability of the Presbyterian Church to meet the new demand for qualified, college-educated clergy. Religious groups such as the Baptists and Methodists had no higher education requirement for their clergy to be ordained, and these groups readily provided ministers to meet the demand of the growing Scotch-Irish settlements. By about 1810, Baptist and Methodist churches were in the majority, and the descendants of the Scotch-Irish today remain predominantly Baptist or Methodist. Vann (2007) shows the Scotch-Irish played a major role in defining the Bible Belt in the Upper South in the 18th century. He emphasizes the high educational standards they sought, their "geotheological thought worlds" brought from the old country, and their political independence that was transferred to frontier religion. In 1746, the Scotch-Irish Presbyterians created the College of New Jersey, later renamed Princeton University. The mission was training New Light Presbyterian ministers. The college became the educational as well as religious capital of Scotch-Irish America. By 1808, loss of confidence in the college within the Presbyterian Church led to the establishment of the separate Princeton Theological Seminary, but for many decades Presbyterian control over the college continued. Meanwhile, Princeton Seminary, under the leadership of Charles Hodge, originated a conservative theology that in large part shaped Fundamentalist Protestantism in the 20th century. While the larger Presbyterian Church was a mix of Scotch Irish and Yankees from New England, several smaller Presbyterian groups were composed almost entirely of Scotch Irish, and they display the process of assimilation into the broader American religious culture. Fisk (1968) traces the history of the Associate Reformed Church in the Old Northwest from its formation by a union of Associate and Reformed Presbyterians in 1782 to the merger of this body with the Seceder Scotch Irish bodies to form the United Presbyterian Church in 1858. It became the Associate Reformed Synod of the West and remain centered in the Midwest. It withdrew from the parent body in 1820 because of the drift of the eastern churches toward assimilation into the larger Presbyterian Church with its Yankee traits. The Associate Reformed Synod of the West maintained the characteristics of an immigrant church with Scotch-Irish roots, emphasized the Westminster standards, used only the psalms in public worship, was Sabbatarian, and was strongly abolitionist and anti-Catholic. In the 1850s it exhibited many evidences of assimilation. It showed greater ecumenical interest, greater interest in evangelization of the West and of the cities, and a declining interest in maintaining the unique characteristics of its Scotch-Irish past. For a more comprehensive list, see List of Scotch-Irish Americans. Many Presidents of the United States have ancestral links to Ulster, including three whose parents were born in Ulster. The Irish Protestant vote in the U.S. has not been studied nearly as much as that of the Catholic Irish. In the 1820s and 1830s, supporters of Andrew Jackson emphasized his Irish background, as did James Knox Polk, but since the 1840s it has been uncommon for a Protestant politician in America to be identified as Irish, but rather as 'Scotch-Irish'. [original research?] In Canada, by contrast, Irish Protestants remained a cohesive political force well into the 20th century, identified with the then Conservative Party of Canada and especially with the Orange Institution, although this is less evident in today's politics. More than one-third of all U.S. Presidents had substantial ancestral origins in the northern province of Ireland (Ulster). President Bill Clinton spoke proudly of that fact, and his own ancestral links with the province, during his two visits to Ulster. Like most US citizens, most US presidents are the result of a "melting pot" of ancestral origins. Clinton is one of at least seventeen Chief Executives descended from emigrants to the United States from Ulster. While many of the Presidents have typically Ulster-Scots surnames – Jackson, Johnson, McKinley, Wilson – others, such as Roosevelt and Cleveland, have links which are less obvious. ^ "Selected Social Characteristics in the United States (DP02): 2017 American Community Survey 1-Year Estimates". U.S. Census Bureau. Retrieved October 14, 2018. ^ Webb, James (October 23, 2004). "Secret GOP Weapon: The Scots Irish Vote". The Wall Street Journal. Retrieved September 7, 2008. ^ Scholarly estimates vary, but here are a few: "more than a quarter-million", Fischer, David Hackett, Albion's Seed: Four British Folkways in America Oxford University Press, USA (March 14, 1989), pg. 606; "200,000", Rouse, Parke Jr., The Great Wagon Road, Dietz Press, 2004, pg. 32; "...250,000 people left for America between 1717 and 1800...20,000 were Anglo-Irish, 20,000 were Gaelic Irish, and the remainder Ulster-Scots or Scotch-Irish...", Blethen, H.T. & Wood, C.W., From Ulster to Carolina, North Carolina Division of Archives and History, 2005, pg. 22; "more than 100,000", Griffin, Patrick, The People with No Name, Princeton University Press, 2001, pg 1; "200,000", Leyburn, James G., The Scotch-Irish: A Social History, University of North Carolina Press, 1962, pg. 180; "225,000", Hansen, Marcus L., The Atlantic Migration, 1607–1860, Cambridge, Mass, 1940, pg. 41; "250,000", Dunaway, Wayland F. The Scotch-Irish of Colonial Pennsylvania, Genealogical Publishing Co (1944), pg. 41; "300,000", Barck, O.T. & Lefler, H.T., Colonial America, New York (1958), pg. 285. ^ a b Leyburn 1962, p. 327. ^ Calendar of Patent and Close Rolls of Chancery, as cited in Leyburn, op. cit., 329. ^ H. Dalrymple, Decisions of the Court of Sessions from 1698 to 1718, ed. by Bell and Bradfute (Edinburgh, Scotland, 1792), 1:73/29. See Dictionary of the Older Scottish Tongue, s.v. toung. ^ Robinson, Philip, The Plantation of Ulster, St. Martin's Press, 1984, pp. 109-128, and Rowse, A.L., The Expansion of Elizabethan England, Harper & Row: New York, 1965, pg. 28. ^ Patrick Fitzgerald, "The Scotch-Irish & the Eighteenth-Century Irish Diaspora." History Ireland 7.3 (1999): 37-41. ^ Dolan, Jay P (2008). "Preface". The Irish Americans: A History. Bloomsbury Publishing USA. p. x. Retrieved 13 August 2015. ^ Leyburn 1962, pp. 327-334. ^ Somers, Robert (1965) . The Southern States since the War, 1870–71. University of Alabama Press. p. 239. ^ American Presidents, The Ulster-Scots Agency. Retrieved 27 October 2011. ^ Kingsley Amis, The King's English : A Guide to Modern Usage, St. Martin's Griffin, 1999, pp. 198-199. ^ "Ancestry.com". Homepages.rootsweb.ancestry.com. Retrieved 2012-06-04. ^ Leyburn 1962, pg 330. ^ Bardon, Jonathan (1992). A History of Ulster. Belfast: The Blackstaff Press Limited. p. 210. ^ Walker, Brian M. (June 10, 2015). "We all can be Irish, British or both". Belfast Telegraph. Independent News & Media. ^ Thernstrom, Stephan (1980). Harvard Encyclopedia of American Ethnic Groups - Stephan Thernstrom - Google Boeken. ISBN 9780674375123. Retrieved 2012-06-04. ^ David Hackett Fischer, Albion's Seed, Oxford, 1989, pg 618. ^ George MacDonald Fraser, The Steel Bonnets, Harper Collins, 1995. ^ Patrick Macrory, The Siege of Derry, Oxford, 1980, pgs 31–45. ^ George MacDonald Fraser, The Steel Bonnets, Harper Collins, 1995, pgs 363 & 374–376; and Patrick Macrory, The Siege of Derry, Oxford, 1980, pg 46. ^ Philip Robinson, The Plantation of Ulster, St. Martin's Press, 1984, pgs 52–55. ^ John Kenyon, Jane Ohlmeyer, John Morrill, eds. The Civil Wars: A Military History of England, Scotland, and Ireland 1638-1660. (Oxford University Press: 1998) p. 278. ^ "The Rebellion of 1641-42". Libraryireland.com. Retrieved 2012-06-04. ^ "...summer of 1717...", Fischer, David Hackett, Albion's Seed: Four British Folkways in America, Oxford University Press, USA (March 14, 1989), pg. 606; "...early immigration was small,...but it began to surge in 1717. ", Blethen, H.T. & Wood, C.W., From Ulster to Carolina, North Carolina Division of Archives and History, 2005, pg. 22; "Between 1718 and 1775", Griffin, Patrick, The People with No Name, Princeton University Press, 2001, pg 1; etc. ^ Rev. A. L. Perry, Scotch-Irish in New England:Taken from The Scotch-Irish in America: Proceedings and Addresses of the Second Congress at Pittsburgh,1890. ^ quoted in Carl Wittke, We Who Built America: The Saga of the Immigrant (1939) p. 51. ^ Kevin Kenny, Peaceable Kingdom Lost: The Paxton Boys and the Destruction of William Penn's Holy Experiment, Oxford University Press, 2009, ppg 119-126. ^ Kenny, Peaceable Kingdom Lost, pp 130-146. ^ Kenny, Peaceable Kingdom Lost, ppg 161-171. ^ Philip H. Bagenal, The American Irish and their Influence on Irish Politics, London, 1882, pp 12-13. ^ Theodore Roosevelt, The Winning of the West, (1906). ^ Olive Dame Campbell & Cecil J. Sharp, English Folk Songs from the Southern Appalachians, Comprising 122 Songs and Ballads, and 323 Tunes, G. P. Putnam's Sons, 1917, pg xviii. ^ Samuel Tyndale Wilson, The Southern Mountaineers, New York: Presbyterian Home Missions, 1906, pg 24. ^ "U.S. Federal Census :: United States Federal Census :: US Federal Census". 1930census.com. Retrieved 2014-08-27. ^ "United States Timeline population". Members.aol.com. Retrieved 2012-06-04. ^ "United States population 1790-1990" (PDF). Retrieved 2012-06-04. ^ "Born Fighting: How the Scots-Irish Shaped America". Powells.com. 12 August 2009. Retrieved 26 May 2012. ^ Griffin, Patrick, The People with No Name: Ireland's Ulster Scots, America's Scots Irish, and the Creation of a British Atlantic World, Princeton University Press, 2001, ppg 164-165. ^ a b c d e f g h i j "Ulster-Scots and the United States Presidents" (PDF). Ulter Scots Agency. Retrieved 12 July 2010. ^ Thompson, Joseph E., "American Policy and Northern Ireland: A Saga of Peacebuilding", Praeger (March 30, 2001), Pg. 2, and Howe, Stephen, "Ireland and Empire: Colonial Legacies in Irish History and Culture", Oxford University Press, USA (March 14, 2002), Pg. 273. ^ "Grant Ancestral House". Discovernorthernireland.com. Retrieved 2012-06-04. ^ "Richard Robert Taft (1614-1700) - Find a Grave Memorial". Find a Grave. ^ "John Johnson". Geneanet. Retrieved 1 July 2017. ^ Jeff Carter. Ancestors of Jimmy and Rosalynn Carter. p. 74. ^ Melvin Ember, Carol R. Ember. Cultures of the world: selections from the ten-volume encyclopedia of world cultures. p. 1129. ^ a b c "About the Ulster-Scots". ^ Sellers, Frances Stead; Blake, Aaron (July 28, 2016). "Our first black president plays up his Scots-Irish heritage — and it has everything to do with Trump". The Washington Post. Retrieved July 1, 2018. ^ Drabold, Will; Villa, Lissandra (July 27, 2016). "Read President Obama's Speech at the Democratic Convention". Time. Retrieved July 1, 2018. Bageant, Joseph L. (2007). Deer Hunting With Jesus: Dispatches From America's Class War. Broadway Books. ISBN 978-1-921215-78-0. Cultural discussion and commentary of Scots-Irish descendants in the USA. Baxter, Nancy M. Movers: A Saga of the Scotch-Irish (The Heartland Chronicles) (1986; ISBN 0-9617367-1-2) Novelistic. Blethen, Tyler. ed. Ulster and North America: Transatlantic Perspectives on the Scotch-Irish (1997; ISBN 0-8173-0823-7), scholarly essays. Byrne, James Patrick; Philip Coleman; Jason Francis King (2008). Ireland and the Americas: Culture, Politics, and History : a Multidisciplinary Encyclopedia. ABC-CLIO. ISBN 9781851096145. Carroll, Michael P. (Winter 2006). "How the Irish Became Protestant in America". Religion and American Culture. 16 (1). University of California Press. pp. 25–54. Carroll, Michael P. (2007). American Catholics in the Protestant Imagination: Rethinking the Academic Study of Religion. Johns Hopkins University Press. pp. 1–26. Dunaway, Wayland F. The Scotch-Irish of Colonial Pennsylvania (1944; reprinted 1997; ISBN 0-8063-0850-8), solid older scholarly history. Dunbar-Ortiz, Roxanne (2006). Red Dirt: Growing Up Okie. University of Oklahoma Press. ISBN 978-0-8061-3775-9. Literary/historical family memoir of Scotch-Irish Missouri/Oklahoma family. Fischer, David Hackett (1989). Albion's Seed: Four British Folkways in America. Oxford University Press. ISBN 978-0-19-506905-1. Major scholarly study tracing colonial roots of four groups of immigrants, Irish, English Puritans, English Cavaliers, and Quakers; see pp. 605–778. Glazier, Michael, ed. The Encyclopedia of the Irish in America, (1999), the best place to start—the most authoritative source, with essays by over 200 experts, covering both Catholic and Protestants. Griffin, Patrick. The People with No Name: Ireland's Ulster Scots, America's Scots Irish, and the Creation of a British Atlantic World: 1689-1764 (2001; ISBN 0-691-07462-3) solid academic monograph. Joseph, Cameron (October 6, 2009). "The Scots-Irish Vote". The Atlantic. Retrieved October 19, 2018. Leyburn, James G. (December 1970). "The Scotch-Irish". American Heritage. 22 (1). Retrieved October 19, 2018. McDonald, Forrest; McWhiney, Grady (May 1975). "The Antebellum Southern Herdsman: A Reinterpretation". Journal of Southern History. 41 (2). pp. 147–66. JSTOR 2206011. Highly influential economic interpretation; online at JSTOR through most academic libraries. Their Celtic interpretation says Scots-Irish resembled all other Celtic groups; they were warlike herders (as opposed to peaceful farmers in England), and brought this tradition to America. James Webb has popularized this thesis. McWhiney, Grady; Jamieson, Perry D. (1984). Attack and Die: Civil War Military Tactics and the Southern Heritage. University of Alabama Press. ISBN 978-0817302290. McWhiney, Grady (1989). Cracker Culture: Celtic Ways in the Old South. University of Alabama Press. ISBN 978-0817304584. Major exploration of cultural folkways. Meagher, Timothy J. The Columbia Guide to Irish American History. (2005), overview and bibliographies; includes the Catholics. Miller, Kerby, ed. (2001). Journey of Hope: The Story of Irish Immigration to America. Chronicle Books. ISBN 978-0811827836. Major source of primary documents. Miller, Kerby (1988). Emigrants and Exiles: Ireland and the Irish Exodus to North America. Oxford University Press. ISBN 978-0195051872. Highly influential study. Porter, Lorle. A People Set Apart: The Scotch-Irish in Eastern Ohio (1999; ISBN 1-887932-75-5) highly detailed chronicle. Quinlan, Kieran. Strange Kin: Ireland and the American South (2004), critical analysis of Celtic thesis. Sletcher, Michael, 'Scotch-Irish', in Stanley I. Kutler, ed., Dictionary of American History, (10 vols., New York, 2002). Vann, Barry (2008). In Search of Ulster Scots Land: The Birth and Geotheological Imagings of a Transatlantic People. University of South Carolina Press. ISBN 978-1-57003-708-5. Vann, Barry (2004). Rediscovering the South's Celtic Heritage. Overmountain Press. ISBN 978-1-57072-269-1. Vann, Barry (2007). "Irish protestants and the creation of the Bible belt". Journal of Transatlantic Studies. 5 (1). Routledge. pp. 87–106. Webb, James (2004). Born Fighting: How the Scots-Irish Shaped America. Broadway Books. ISBN 978-0-7679-1688-2. Novelistic approach; special attention to his people's war with English in America. Scotch-Irish or Scots-Irish: What's in a Name?